Smoothies of all kinds are popular these days. I ordered a Green Smoothie from a restaurant that I really enjoyed, came home and tested a few ingredient combinations until I was happy with the taste. It received a blog worthy pass in my test kitchen. Try it! 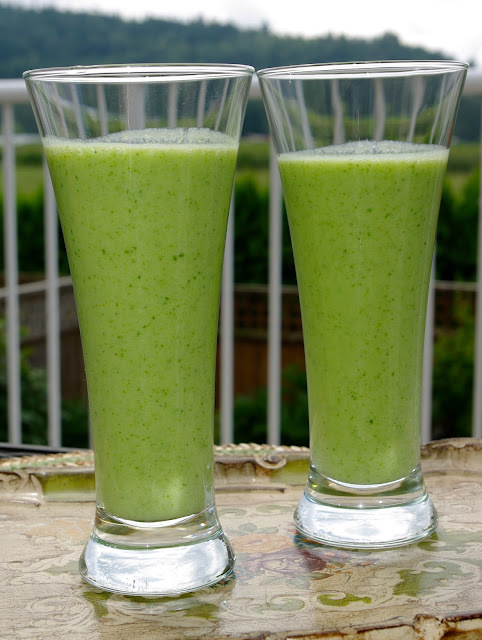 I think you'll be pleasantly surprised at how refreshing this healthy drink tastes. Add all ingredients to a blender and blend until smooth. Serve immediately. I agree - green smoothies are delicious and your combination looks yummy. I always add a dash of cinnamon for extra flavour and for its health benefits. Do you use this as a meal, say for breakfast? An afternoon pick-me-up? What is your favorite use for it? Nice! I have been on a green smootie kick since last December and I can truthfully say they have changed my life. I have eliminated that round middle I thought might be with me forever (I'm 56) and it really was effortless. These smoothies are so filling and what other way can a person realistically get 8-10 servings of fruit/veggies per day? Get rid of the soy milk and it would be healthy. Ok. I'll pick up some spinach this afternoon! I''m good with soy milk occasionally, but I may also substitute high-protein yogurt and almond milk. I've gotten into juicing fruit and veggies and then making the smoothies with home made yogurt. I love the combo of sweet potato, carrot, spinach or kale, grape and apple or pear. For the smoothie I add a bit of chia or flax and coconut milk and oil and hemp oil with the yogurt...keeps my digestives very happy. The fats are very good for you....Might also try adding some avocado! These sound so good! My basic green smoothie is spinach, kale, celery, cucumber, flax seed, apple, fresh parsley, water and ice.